Define the string through those points. 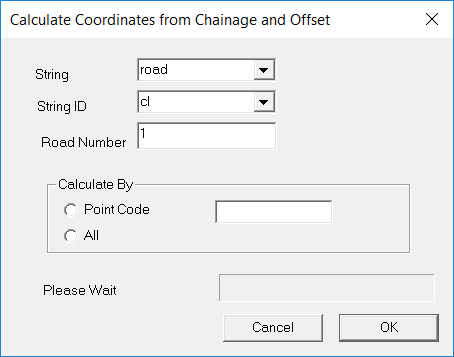 Calculate coordinates of points entered from a level sheet. You should Start CDS and Open Job EX5 in the Foresoft\cds2\tutor folder. 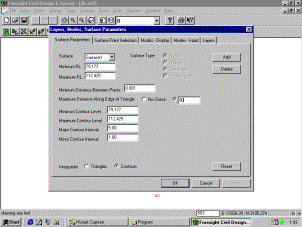 Use the “?” key to bring up the Add/Edit/Query window, and Point 1 will be displayed as seen in the screen at right.If you look at its Chainage and Offset you should confirm that it has a chainage of 840 and an offset of 0, so it is the suspect we are looking for, so we need to give it the coordinates as seen on the plan. 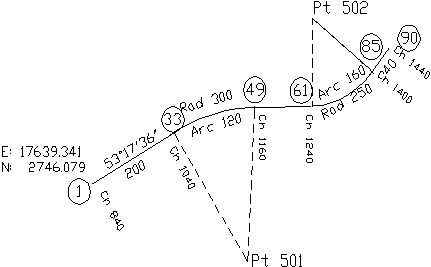 From the alignment diagram, you see that the point on the centreline of the cross section at Chainage 1040 is point 33, so enter 33 for the new point.Select Apply, and a window will appear informing you that Point 33 is already in the database. 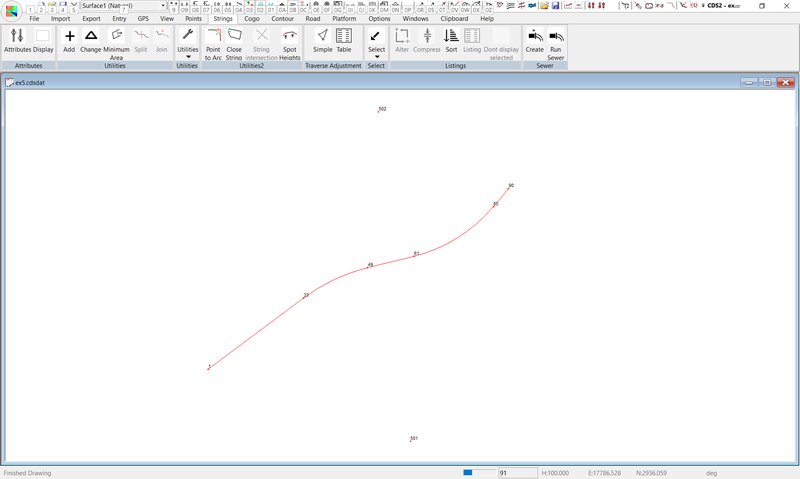 You will see that the bearing and distance calc is ready to move on from point 33 which is fine.Position the cursor in the Bearing field where 53.1736 is still showing. 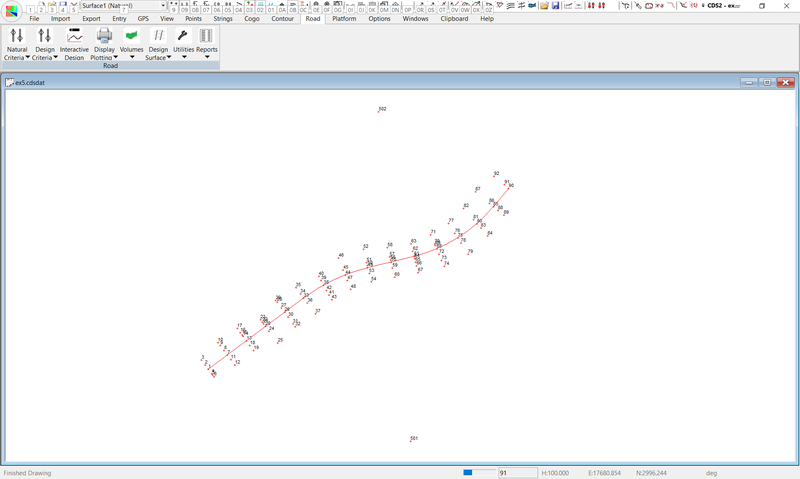 Next position your cursor in the bearing field, and this time press the “L” key to take 90 from the bearing shown. Enter a Distance of 250 and a Point Number of 502 and apply. 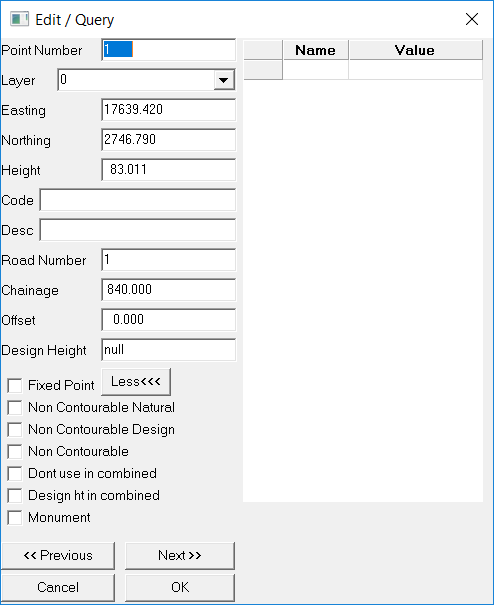 Use ‘P’ in the bearing field to specify the bearing between Points 85 and 502, and press ’R’’ to add 90 to this value. Enter a distance of 40 to a new point number of 90 which you will need to recalculate. The screen will now be similar to that seen at right.Select OK and you have saved away the alignment. 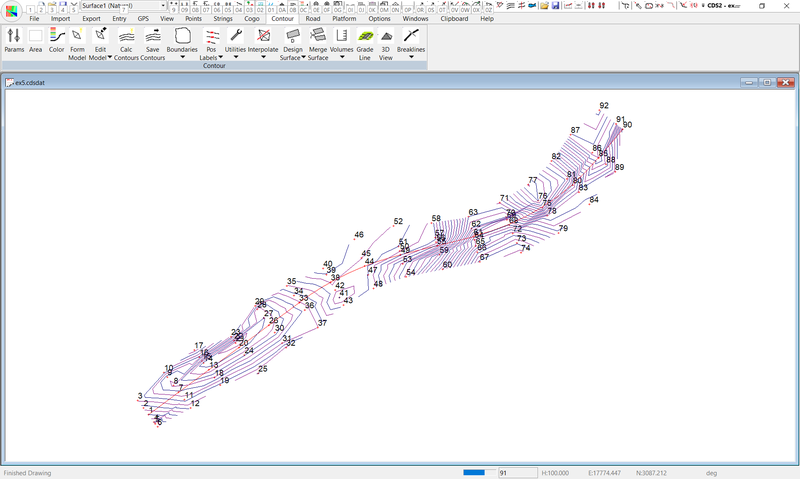 Next form the model, and then calculate contours to achieve the screen above.